The mbed NXP LPC1768 Microcontroller is designed for prototyping all sorts of devices, especially those including Ethernet, USB, and the flexibility of lots of peripheral interfaces and FLASH memory. It is packaged as a small DIP form-factor for prototyping with through-hole PCBs, stripboard and breadboard, and includes a built-in USB FLASH programmer. 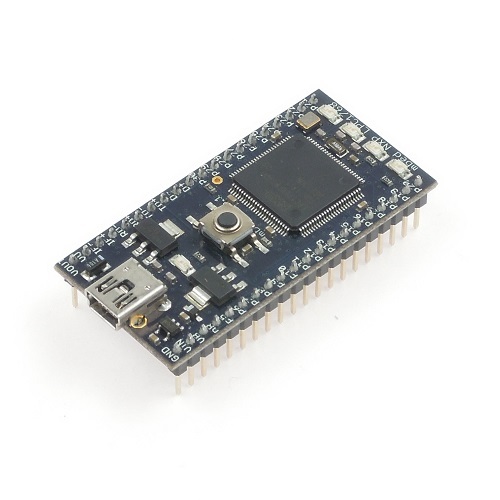 It is based on the NXP LPC1768, with a 32-bit ARM Cortex-M3 core running at 96MHz. It includes 512KB FLASH, 32KB RAM and lots of interfaces including built-in Ethernet, USB Host and Device, CAN, SPI, I2C, ADC, DAC, PWM and other I/O interfaces. The pinout above shows the commonly used interfaces and their locations. Note that all the numbered pins (p5-p30) can also be used as DigitalIn and DigitalOut interfaces. The mbed Microcontrollers provide experienced embedded developers a powerful and productive platform for building proof-of-concepts. For developers new to 32-bit microcontrollers, mbed provides an accessible prototyping solution to get projects built with the backing of libraries, resources and support shared in the mbed community.